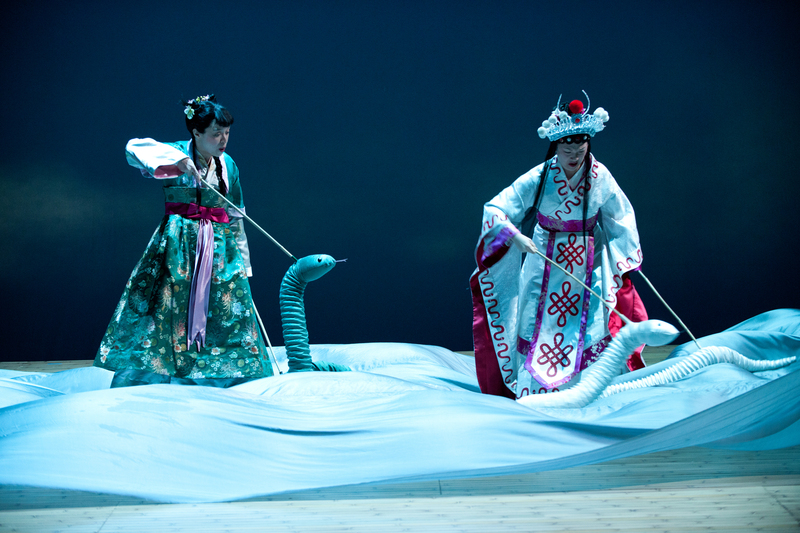 Green Snake (Tanya McBride) and White Snake (Amy Kim Waschke) ride the clouds to the earth below. Photo: Jenny Graham. After two gorgeous days at the Oregon Shakespeare Festival–Day One and Day Two–I was ready for an adaptations day in the theatre, beginning with Mary Zimmerman’sThe White Snake and ending with a new translation of Chekov’s Seagull. Recently, there’s been a theatre trend of producing retellings or reworkings of old stories. Perhaps, it’s not a new trend, but as it flows in and out of fashion, the retellings that shouldn’t happen are easily spotted. And then, there’s Mary Zimmerman, who’s known for a number of truly compelling pieces of theatre, including Metamorphosisand Arabian Nights. Zimmerman goes into a rehearsal room with her chosen artists (actors, designers, dramaturgs) and says, “Let’s do a show about x,” and based off their rehearsals she goes home and writes the script (yes, I’m madly in love). And this is how White Snake (through July 8; tickets) came about at OSF on the Angus Bowmer stage.